WELCOME TO MUCKLETON MEATS, dedicated to bringing you the best pork, full of the flavour that is missing in so much of the food we buy today. Muckleton premium pork sausages, meatballs and burgers are made on the farm to our own special recipe, using high quality, coarse cut British pork from our own and occasionally, other selected farms. You will taste the difference in our high quality, meaty, full of flavour products. 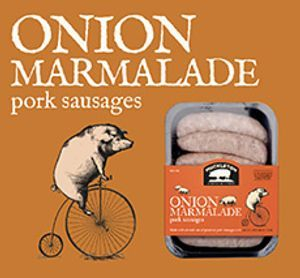 Made from pork reared using responsible farming methods and with high animal welfare standards. So when you buy Muckleton products it means you're playing a part too..
Succulent, juicy and full of meat, our bangers, meatballs and burgers are the business! The business started in Muckleton and was based there for ten years. In 2016, the founder retired and the business moved forward with David and Jan at the helm, high into the South Shropshire Hills. Our small herd of pedigree Jersey cattle provide milk for ourselves, their calves and the pigs. We now sell through farmers' markets, local food festivals and local shops. Our products are also used in high class catering establishments in Shropshire. To check out where you can buy our products, please visit our Facebook page Muckleton Meats.